Custom Skyrim Xbox – modded case. Written by Will on November 23, 2011 and posted in Gaming Merchandise. The other day I found a Skyrim wallpaper for my desktop. Simple black background, says “Elder Scrolls V: Skyrim” on it and has the Skyrim dragon logo. I decided to crop the logo out and set it as my Facebook profile picture. A friend or 2 liked it and another commented on the picture. In response I said that “I’m making one of those” and at the point I didn’t know how or what I was going to make it from. I woke up a day or so ago and almost as soon as I got up I was like “I’m making that Skyrim Dragon today.”. Still not knowing how I soon came to the idea of cutting an old computer case and making it from the metal… and then it dawned on me: I’m making a Skyrim Xbox. I’m cutting the dragon into the case. And that’s just what I done. I got a spare case and a pencil and sketched the dragon logo onto the case. I made it big enough to cut out the entire XBOX 360 stamp on the side (No point in cutting through some of the XBOX 360 and leaving a few letters still in place). I got my cutting tools and got stuck right in. As soon as it was sketched I began cutting, large areas at first and then tidying up the edges of them. It quickly started to take shape and before I knew it I was etching out details with the smallest files I could find. It worked really well, there are a few little blemishes that I just couldn’t get out though. It was done, sketched, cut, detailed and tidied. It was too late to get hold of any plexi for mounting behind the dragon so I called it a night. Next day, early afternoon, I went out for the plexi-glass. While out I decided that I wanted to put LED’s inside the case. I had Large LED’s for inside the case but no SMD’s for the ROL mod and I wanted the lights to match. Because I couldn’t change the color of the Xbox poer button lights I decided that I’d use green LED’s inside the case. After buying the plexi I decided I was going to paint it too, green to match the lighting. They had green paint (83WBC) but only a really dark almost black green and a light “lawn green”. I wanted something in between. 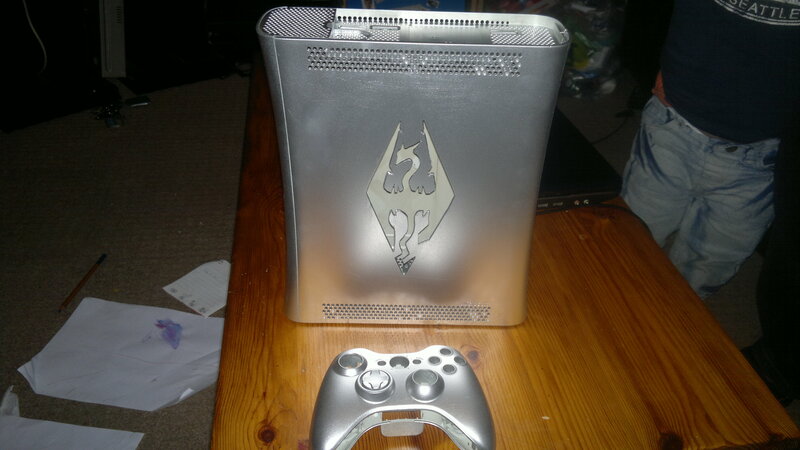 Then I saw some silver paint… that was it, it was going silver – my Silver Skyrim Xbox. It’s almost finished, needs a little sanding and a few more coats of paint. Sadly it’s raining like crazy today so I can’t finish it. i am however woking on getting 2 of the logos onto the face of the controller too so I have a day to think about how to do that. However as luck would have it I just stumbled across the template like 3 days ago that I used to cut the dragon out. I’ve got a few spare 360 cases from back when I was modding console cases as a hobby so if you really want one the same as this I could probably make another one for you.